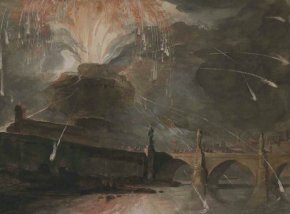 Caen, Musée des Beaux-Arts from 4 February to 23 April 2012. The exhibition was first presented in Ottawa, Musée des Beaux-Arts du Canada, from 21 October 2011 to 2 January 2012. Over the course of the 18th century, despite several exceptions, notably that of Venice, Italy’s artistic stardom began to fade and its dominance to recede in favor of French painting. For this reason, the history of French artists who traveled to Rome in search of inspiration is in itself an essential subject for the understanding of art history. Although many artists would return to France, others remained and were to become almost Italian such as Pierre Subleyras, one of the finest rediscoveries of the last century. This is the subject presented by the Musée des Beaux-Arts in Caen, after Ottawa, in an exhibition which we should have discussed earlier. It is in fact remarkable both for its presentation and the quality of the works selected. Nor should we forget the catalogue, very traditional and containing very thorough entries. Paintings are shown along with a majority of drawings, the few sculptures displayed are not included in the catalogue. However, it is sometimes difficult to write about exhibitions which seem too "obvious". Although the subject has never been treated on its own, we had the impression of having already seen it. Its Canadian origins no doubt explain this impression. 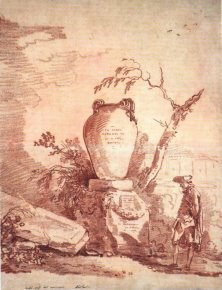 For a public which is less familiar with Hubert Robert (ill. 1), François Boucher or Joseph Vernet, which has not seen the exhibitions Jean Barbault in Strasbourg, Subleyras or Fragonard in Paris, or even L’Antiquité rêvée recently at the Louvre or Tivoli at the Musée Cognac-Jay, the subject might seem new, but for French visitors this is not the case. We can therefore only express a positive opinion but, alas - and this is our own fault - do not have much to say about it except that it covers the subject in a rather complete manner. 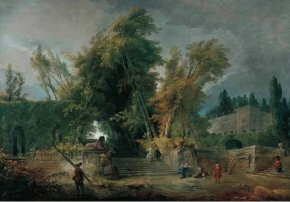 Though these subjects and artists are well known, we are very pleased at having such an extensive selection of works from North American collections, a rare happening in France, come here. Indeed, this is the first time they are exhibited in this country. 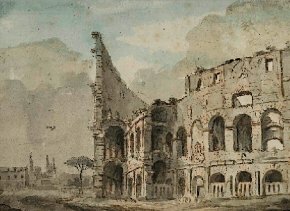 Ottawa was generous in its loans, including a beautiful View of the Coliseum by Jean-Baptiste Lallemand (ill. 2) as well as a very recent acquisition (purchased at the Thomas Le Claire Gallery in Hamburg) of a beautiful red chalk drawing by Hubert Robert (ill. 3). French museums such as Besançon, Valence, Orleans and the Louvre have also granted important loans to the exhibition. We reproduce here a magnificent gouache by Louis-Jean Desprez from the Musée des Beaux-Arts in Rouen in the Baderou collection and which was previously shown only once in 2006 in Grenoble (ill. 4). Collective work, Pour l’amour de l’art. Artistes et amateurs français à Rome au XVIII siècle, 2011, Silvana Editoriale, 255 p., 35€. ISBN : 9788836620531. Visitor information : Musée des Beaux-Arts de Caen, Le Château, 14000 Caen. Tel : + 33 (0)2 31 30 47 70. Open every day except Tuesday, from 9:30 a.m. to 6 p.m.. Admission : 5€ (reduced : 3€).